Musky Lure Storage - - - 5 messages. Showing 1 through 5. Anybody have any tips for custom portable musky lure storage. The best tip I have received so far seems to be...Take a plastic Milk Crate and run s couple metal dowllings across the long way so you can hang stuff from them. I also have heard of the foam cooler trick. Got any others? I have about 7-10 lures and don't have room in my boat for a giant box (and don't want to pay to buy one either). A five gallon bucket works well for me! Hang them from around the edge. 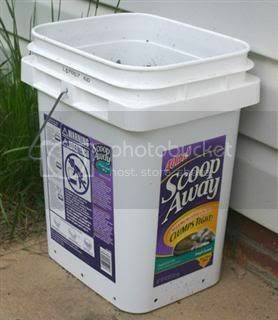 If the 5 gallon bucket is to big I use the smaller cat litter square plastic buckets for a variety of use's. I'm a bit late on this post but thought any time before June is OK. Any of the buckets or crates work great for storing the lures but you may want to consider dividers to keep them from hooking up with each other. PVC tubes cut to the desired length work great in any of the buckets, cat litter boxes or milk crates. The cheap ($4 to $5) clear Plano tackle boxes work the best for me. You can buy the larger ones for the large baits and the thinner ones for the smaller baits. They fit well in boat compartments and being clear it's easy to see what's in them. The various hanging ones always got in the way for me and the baits tangled. I do keep one small hanging one in a live well for the baits I'm using that day. It's made out of clear PVC and I bought it at Thornes in Fridely but it wasn't cheap.